I've written about Wacky Cake and now I'm writing about Funny Cake. You may be wondering if we are so serious a people that we have to live vicariously through the names of our desserts. Funny Cake is one of those baked goods whose name doesn't really make a whole lot of sense. 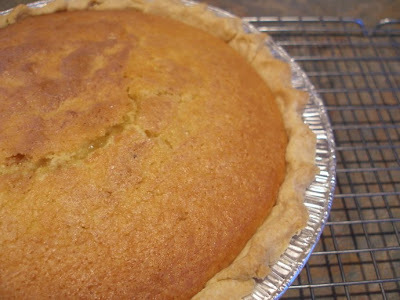 It's called a cake, but it's baked in a pie crust. 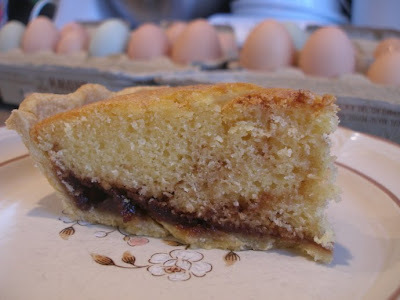 Similarly to shoo-fly pie, it's often eaten for breakfast instead of following a healthy dinner as most cakes are. 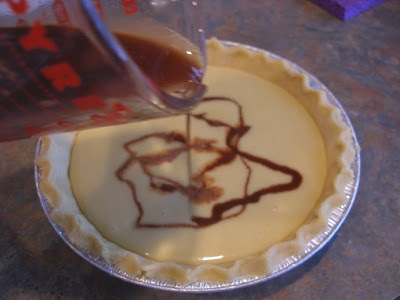 Maybe it's called funny because you pour a chocolate batter onto the top of the cake (or pie or whatever it is) and it ends up on the bottom. Whatever the reason, it really doesn't matter. You make Funny Cake because it's delicious. It's simple, moist, chocolaty and fabulous. And you can eat it whatever time of day you please. And, it's super easy to make. How's that for some good reasons? Nesquik is a chocolate powder that when added to milk makes chocolate milk. The same Nesquik container has been in our house for 4 or 5 years. The only time we use it is to make Funny Cake. 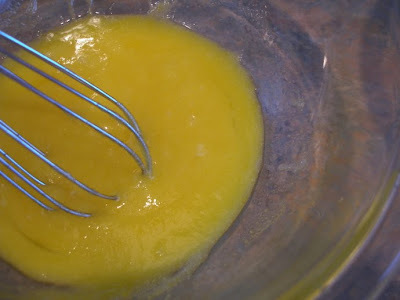 In a large bowl, beat the sugar (3/4 cup), oil and egg together with a whisk. Notice how yellow our eggs are. 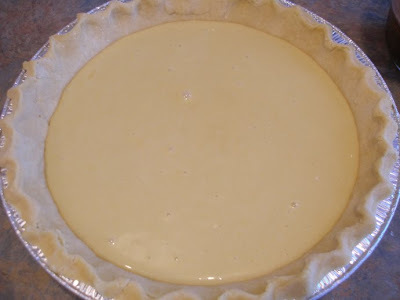 Add the flour, baking powder, milk and vanilla and beat well until smooth. 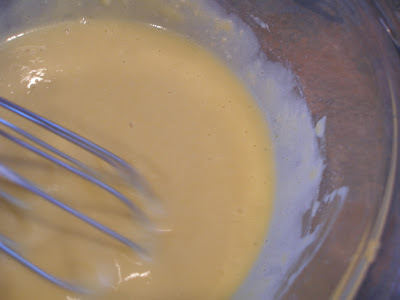 Set this batter aside. In a small bowl (I like to use a glass measuring pitcher because it allows me to pour easily) combine the sugar (1/2 cup), Nesquik and warm water, beating it well with a whisk until the sugars are dissolved. 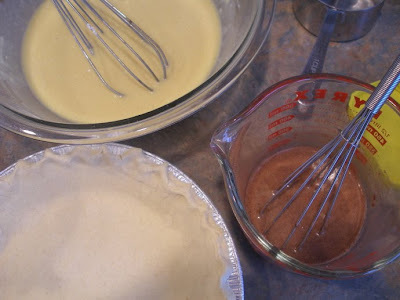 Gently pour the chocolate mixture over the top of the vanilla batter as shown. Bake in a 350 degree oven for 30-40 minutes or until a knife inserted comes out clean. Let cool to room temperature and serve. Oh. There it is. Isn't that funny? 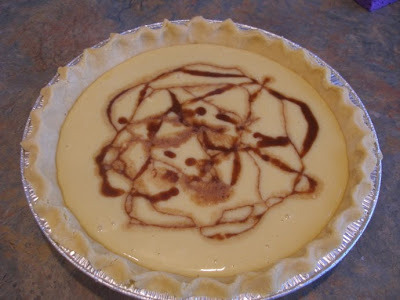 Yes, it is funny ~ and shouldn't it be called funny PIE since it is in a pie crust?? :) Whatever it's called, it looks and sounds yummy...I'm sure the kids would enjoy it. Thanks for sharing! Is there another chocolate something that would work in place of the Nesquik? Damian would be surprised if one day he came home and I had made funny cake! I definitely will do it! Marla, Hello! I bet hot chocolate mix would work. Give that a whirl. Make sure to let me know if it works and if so, I will add it as an alternative ingredient in my recipe:-).